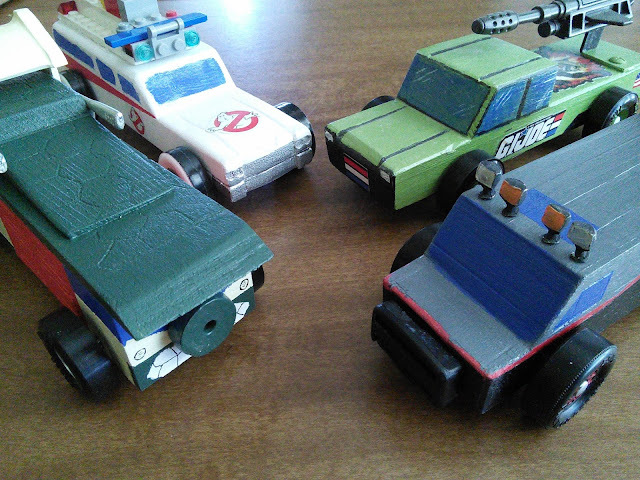 Ever since my boys began entering the annual pinewood derby race at our local church, I decided to join in the fun by creating some of my favorite pop culture cars. The first year I entered, I found inspiration from some retro stickers and made my own custom G.I. Joe truck. Last year, I used the 30th anniversary of Ghostbusters as motivation to create Ecto-1. I was pretty sure I couldn't top that car, but I'm pretty pleased with both vehicles I made for this year's race. I decided to take it easy on myself and create one of my TV favorites with a simpler design, B.A. 's beloved van from The A-Team. Up to this point, my boys usually wanted designs based on real cars but my youngest had some trouble with deciding this year. I suggested he might want something from one of his favorite shows like I mostly do. He finally decided he wanted the Party Wagon from the Teenage Mutant Ninja Turtles. Yike! 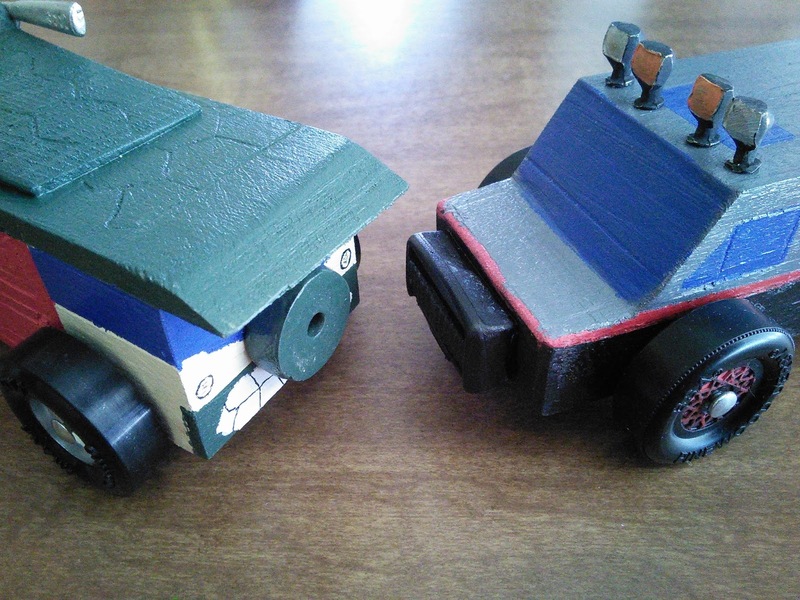 So, this year I got to test my skills again by creating two pop culture vehicles. For the TMNT van, there were so many versions to choose from that I decided to let my son dictate the color scheme and design the way he wanted. As you can see from the picture above, I cut out a piece to glue onto the roof because it would have taken me forever to shape it with the tools I had. 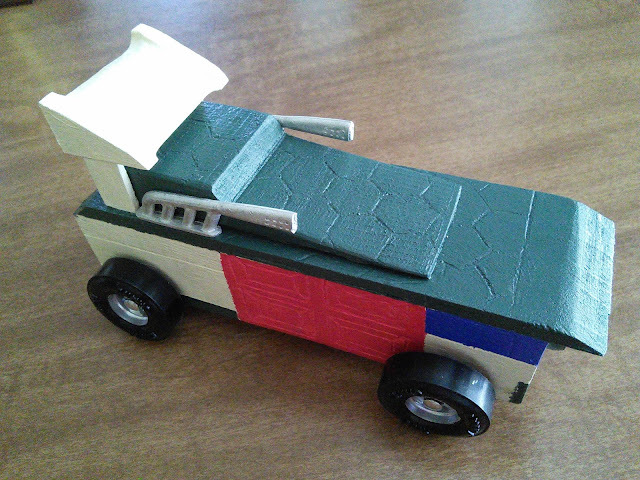 But even though I was limited, I knew a couple textures would be necessary to make the van really stand out, the unique side doors and the turtle shell roof. The van from the 1987 cartoon series had that green elevated roof that opened up with the body mostly tan in color. Most fans know that the side doors on the original party van toy were red for some reason and most toy iterations including the new Nickelodeon series also have red side doors. So, my son decided he wanted red doors on our pinewood car. 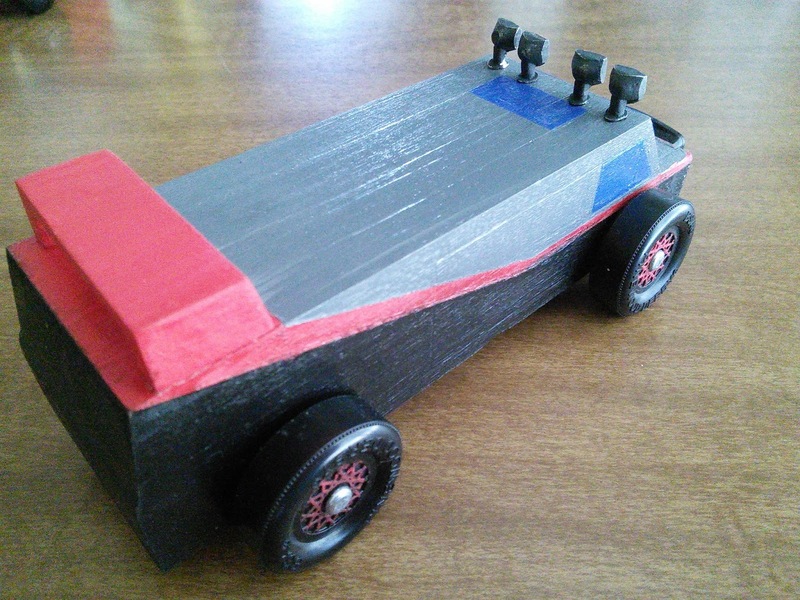 Here's a little #PinewoodDerby progress report with just one week before the big race! Doing the red detailing on the #Ateam van and red doors for the #TMNT van. Got the wrap on for Jackson's Mustang. We'll see you at the finish line! After painting the doors, I used a simple metal nut to trace the hexagonal shape onto the roof and simulate the turtle shell. I shaped the windshield visor when I originally cut the wood and I used the leftover block for the huge spoiler in the back. 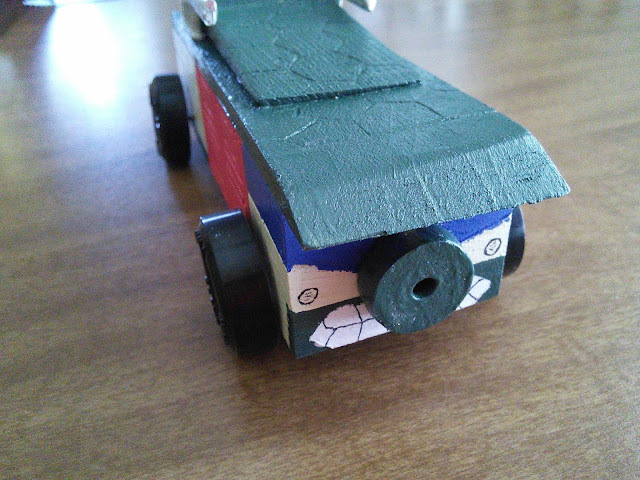 I shaped a white mouth on the bumper and used a fine-point marker to draw the teeth and headlights. We talked about using an actual pinewood tire for the front spare, but I found a smaller rubber tire that was more proportionate. All in all, I thought it turned out great. 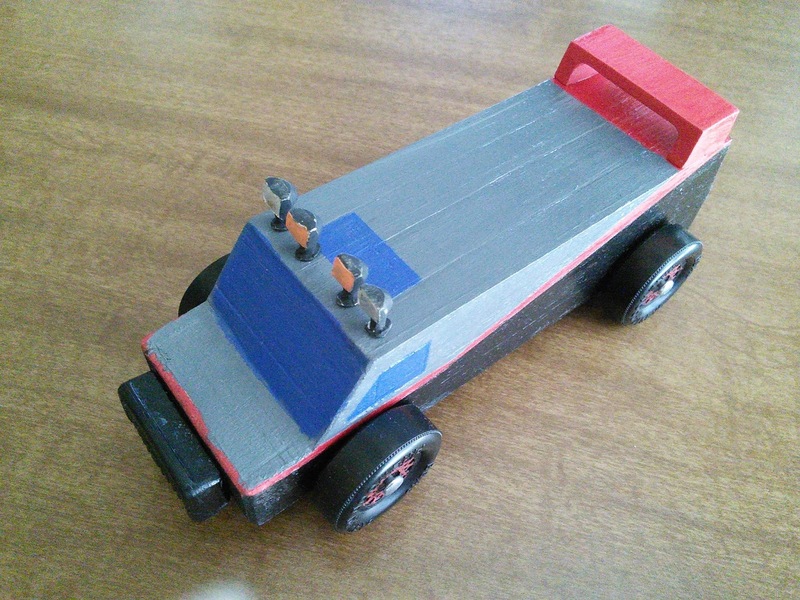 #PinewoodDerby time again. Since I went all out last year with Ecto-1, doing something easier this year...I love it when a van comes together! As you can see from above, the A-team van started with just a basic block kit. After tracing out the angles, I used a friend's band saw to make the cuts. Again using leftovers, I found a small piece for the spoiler and used my grinder to do the shaping. The grill guard was a bit of a challenge, but after digging through a junk drawer, I thought a plastic buckle might work after some trimming. Using a flat head drill bit, I carved out lines for the windows and doors. I painted in stages, taping off sections for the black, red, and grey areas with masking tape. I also used wheels that I could paint the spokes red to better match the actual van. From the clearance packs of accessories, I had some round lights for a baja car design. I painstakingly grinded those round lights into squares to also match the actual van and it's off-road roof lights. I painted the bases black and left the face silver on the outer lights and used orange paint for the middle ones. The grill guard took two tries to stay on with super glue, but it made it through the race intact. It's a little large, but I thought it worked well.